When first presented as an initial concept in 2007, the new stadium for Winnipeg was to have two leaning arches, touching one-another over the centre of the pitch. It would have been a truly iconic solution, but since that concept almost everything has changed. First the location. New stadium was initially planned just south of the demolished Canad Inns Stadium in western Winnipeg. Eventually the site was dropped for one at the University of Manitoba Campus, making the new ground also home to academic teams. Then the design changed as well. Finalised by the same architect team of Raymond S. C. Wan, the stadium kept its two arches, but they never met in the middle, remained straight over the stands. The roof of Investors Group Field, held by both arches, also changed, became intensely corrugated. And finally the seating layout also changed very significantly. Instead of one single tier for 30,000, two tiers were created over the sides and room for additional second tier behind goals, should there be a need. What caused a lot more concern are the changes in cost and delivery time. Instead of $195 million, the stadium cost in excess of 200 million. That may be a small inflation when compared to publicly-supported stadium projects around the world, but it cost the project some criticism. Even more came as the delivery time of mid-2012 had to be scrapped and in the end delayed by another year. 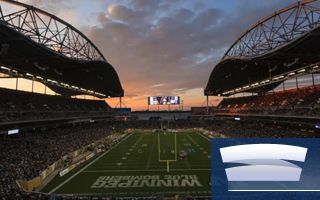 This forced the Winnipeg Blue Bombers to play one whole season more at Canad Inns Stadium. Significant part in the delays was played by roof works. Installation of some elements was severely delayed by high winds that made the light structure impossible to mount atop the stadium. Today it’s one of the most unique roofs in the world because of the corrugated form that meets one presented in renderings. With several changes done to the initial project, the new seating layout proved better both in terms of fitting additional sections in the future and also incorporating skyboxes into the two levels. Altogether there are 52 lounges, assuring revenue stream exceeds the one from Canad Inns Stadium. Though not without trouble, the stadium was finally tested by fans in 2013 and seems to have a bright future ahead. The Grey Cup is to be held here, while in 2015 the FIFA Women’s World Cup is also coming to Winnipeg. This is Canada’s first nominee in Stadium of the Year. Impressive enough to be an important one? It all depends on your vote, so don’t forget to select your favourite new stadiums!